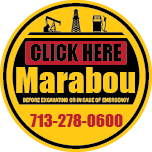 Marabou Midstream working with its sister company, Marabou Superior Pipeline, offers you the ability to contract or in some cases, dispense with the operations of your existing system. Marabou recognizes the demands placed on owner/operators of field transportation and processing assets. By leveraging the resources in place to manage our own pipelines, you can relieve yourself of the growing regulatory, reporting, and liability burden associated with these assets.